Color dye image, digitally scanned. Taken March 23, 1986 at approximately 5 AM local (Eastern Standard) time from Middle River, Essex, Maryland. Original film image on Fujichrome 800 captured with 50mm lens at f/1.7, 15 sec. exposure. Photo courtesy Herman Heyn. 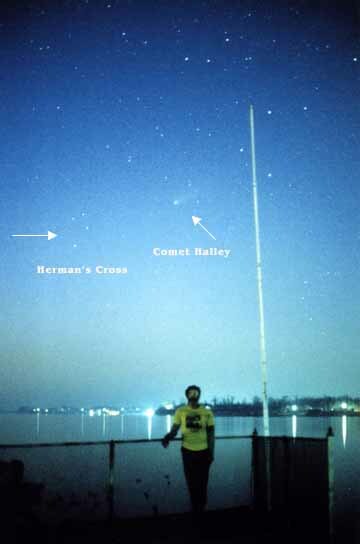 The image shows the handle stars of the Teapot in Sagittarius at right (near the top of the flagpole in the foreground), Comet Halley at top center, Herman's Cross at left center. Herman Heyn is leaning against the fence and is wearing a yellow Halley's Comet t-shirt. Besides in my own photo, the group appears in Halley's photos in the June '86 S&T (pp. 560-61). It is between SGR and CAP on A's late summer-fall sky maps but not on S&T's. Its four, 4th magnitude stars are Omega, 59, 60, and 62 SGR. To help me stake my claim, my longtime, California astrofriend, Derek Wallentinsen, put my story and photo on line. Tom Bisque of Software Bisque added it to his own asterisms list. George Lovi notes that in ancient China it was known as Kou, the Dogs. In his classic compendium STAR NAMES, Richard Hinckley Allen writes that Ptolemy (2nd. cen. A.D.) called the group Terabellum, the Quadrangle. Searching through antique sky atlases in Baltimore's Peabody Library, the most recent sky map labeling I could find for it (Terebellum) is in Joannis Bode's Uranographia of 1801. In the here and now, however, under Terebellum you will see a detailed description of the four stars on Wikipedia. Possibly, had I known of these earlier incarnations, I would have reevaluated the Herman's Cross idea, but I didn't, so now the ball is rolling! amazingly photogenic, showing up in many published astrophotos. Check out the one on p. 57 of July 09's S&T, where it is 1/2-inch in from the left edge. 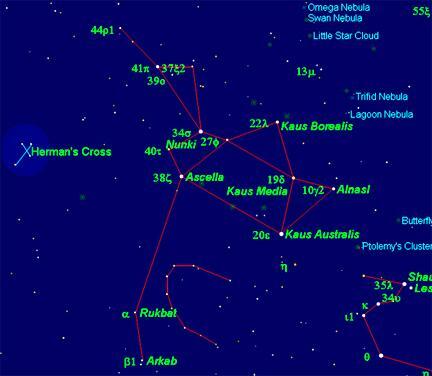 If you spot my asterism next summer, please let me know how it is faring. 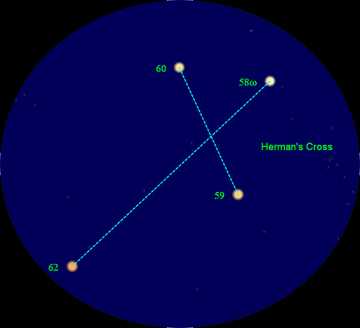 As well, when you notice a little knot of four stars between SGR and CAP on a sky map or in an astrophoto, remind yourself, "Hey, there's Herman's Cross!"